The westbound lanes of Route 40 in Elkton littered with damaged vehicles after a stolen truck out of the Baltimore area tried to squeeze between them at the light going the wrong way. "The guy in front of me told me he saw the guy coming up the righthand side going the wrong way in the right lane and he tried to go between us,” said Tom Braksator of Dover who had been sitting at a red light, “We're actually pushed apart. That's what caused most of the damage, and (he) went past us and hit the cars behind us and hit the curb back there and wound up on his side, jumped out and went running." But he wouldn't get far. Cell phone video captured in the seconds after the crash shows police apprehending the suspect where he hid beneath an outdoor dining table at a nearby Sonic Drive-In. Thus, ended the pursuit, which had started up to 50 miles away. "We received information that Baltimore City was involved in a car chase in the eastbound lanes of Route 40,” said Capt. Joseph Zurolo with the Elkton Police Department, “Upon reaching the area of Route 40 and Route 279, the suspect vehicle crossed the median and started travelling eastbound in the westbound lanes. At that point, I believe the officers called off the chase, but the suspect continued." We later learned the original call came out from the Regional Auto Theft Task Force or RATT and it was a Ford F-150 pickup, which had been stolen. 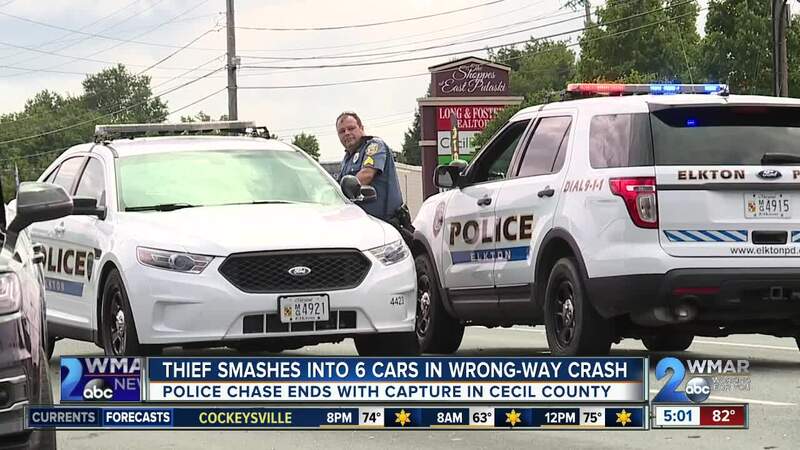 It appears that same driver had rammed a police car before crossing the Hatem Bridge more than 15 miles away from the intersection in Elkton where he would strike six cars before his flight abruptly came to an end. "My wife was sitting there. She was in the passenger seat so that could present a problem," said Braksator, "I understand they took a couple people away. I don't think they were major, but some minor cuts and bruises probably... banged up." Paramedics transported one victim to an area hospital with minor injuries and the suspect was taken to Christiana Hospital. At this hour, police have not identified the alleged car thief who will face a lengthy series of charges.